There were many high points of the Foodbuzz blogger festival, but the blowout dinner from Outstanding in the Field, held in the "field" of the Greenleaf Produce Warehouse off Bayshore Avenue, was the uncontested star of the show. Dennis Lee of Namu led the effort in the kitchen, and turned out course after course of pan-asian-fusion food including mushroom dashi with three mushrooms, rare sea trout with crispy Japanese curry bits, and soy braised beef cheeks and oxtail. 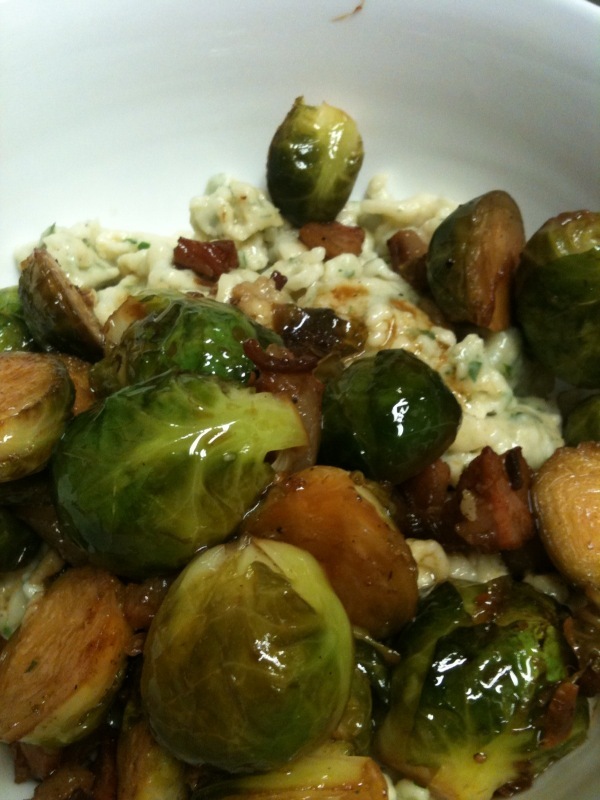 But the runaway star were the roasted brussels sprouts with ponzu-fried garlic, guanciale, and bonito flakes - a fusion of exotic Easern flavors, with humble European ingredients. Reverse engineering this delicacy became an obsession of ours and of several other food bloggers, and our best attempt follows. (A few other blogger have tried it too) and Foodbuzz also posted Lee's recipe here, but I think ours is a pretty good blind attempt. 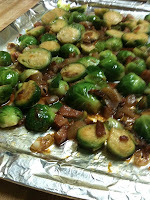 We clearly remembered three things that we wanted to duplicate: a fully cooked but not mushy consistency on the Brussels sprouts, small pieces of crispy bacon, and a flavorful, slightly reduced sauce that coated the sprouts. We also wanted to replicate the deep umami flavor with some citrus. 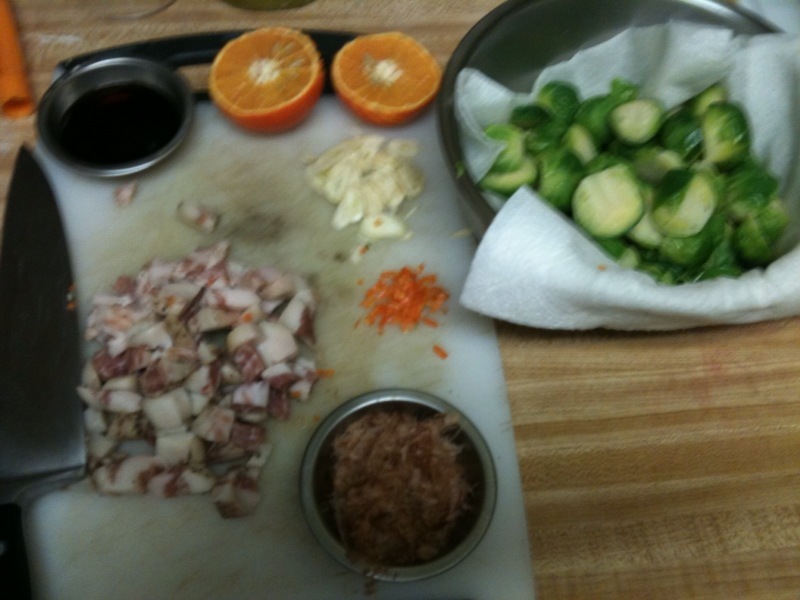 From that we devised a method: par-boil the Brussels sprouts (gently to keep them intact), crisp the bacon and garlic in a saute pan, deglaze with ponzu, then toss everything together and reduce the sauce somewhat before laying in a roasting pan to brown in the oven. What's Guerrilla: Brussels Sprouts are expensive by the pound, but cabbage and pork dishes of all kinds are a mainstay of the Guerrilla Gourmet's project. 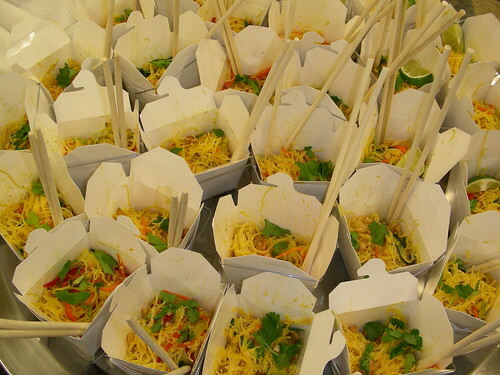 What's Gourmet: A bold fusion of European ingredients with exotic, earthy Asian flavors. 1 lb Brussels Sprouts, stems trimmed and heads halved. 1) Par-boil the Brussels sprouts in gently simmering water for 5-10 minutes. Check them frequently to prevent overcooking, and dump in an ice bath to arrest the process. 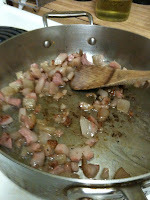 2) Cook the Guanciale gently in a large saute pan until it gets crisp, then pull it out with a slotted spoon. 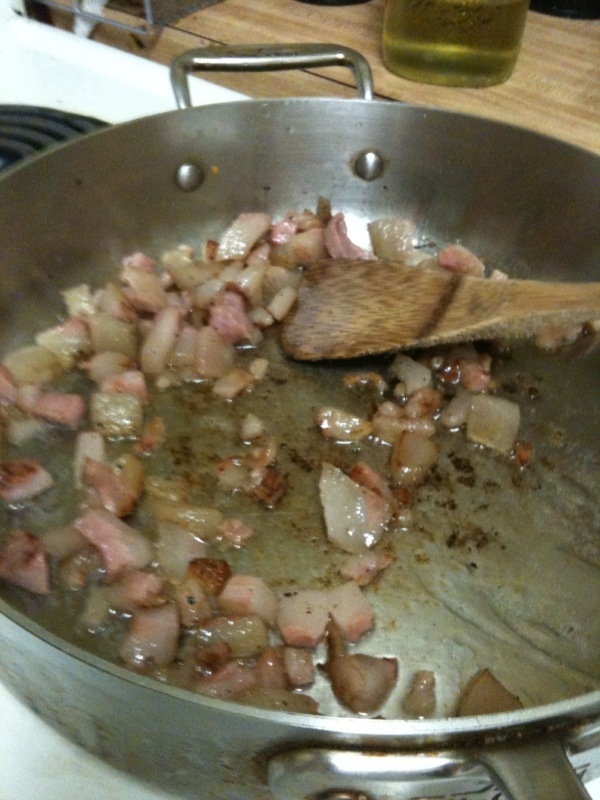 3) Add more oil if the pan is dry, then crank up the heat and toss in the garlic and zest. When everything is fragrant, toss in the ponzu, zest and bonito flakes and scrape the bottom of the pan to get all the brown bits. Add the Brussels sprouts, stir to coat everything, and let the liquid simmer a bit. 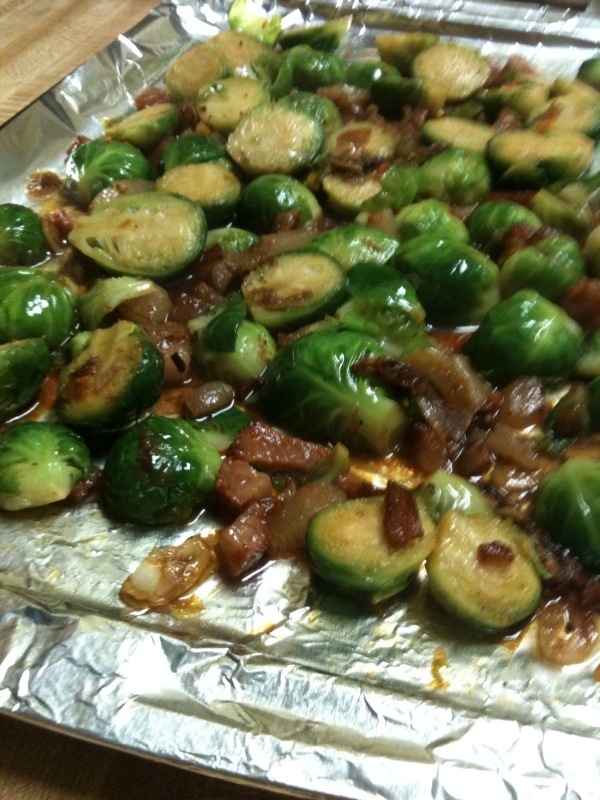 3) Spread the sprouts and sauce out thinly in a large roasting pan and pop into a 400 degree oven for five minutes, then shake the pan, add the bacon back in, and give it five more minutes. 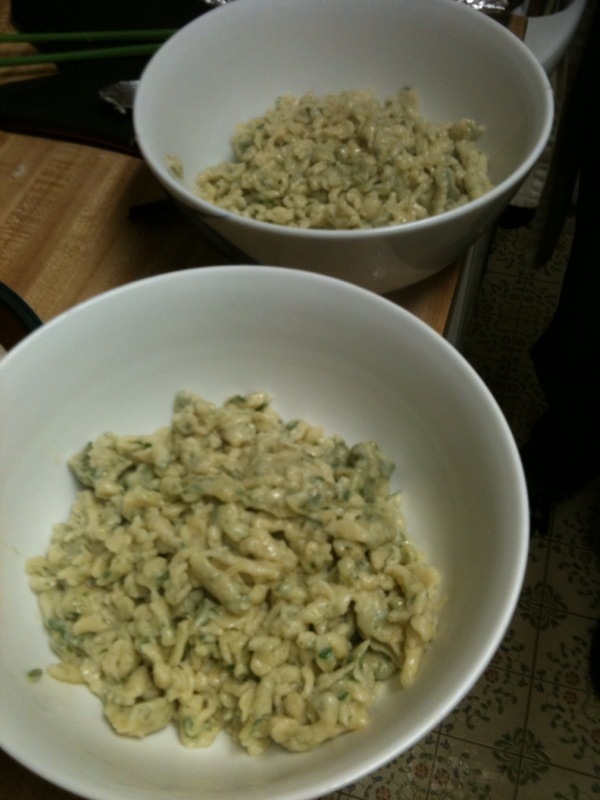 4) Serve over something starchy (in keeping with the fusion theme we had spaetzle) and enjoy! Troubleshooting: The first time we did this we used 1/4 pounds of bacon (three pieces) and it was delicious, but pretty greasy. Also, the bacon ended up braising in the sauce and losing the crispness that we remembered, so in this recipe we pulled it out and reintroduced it at the end. Lee's method is totally different, and we'll definitely do it that way for next time, but we're still pretty proud of our attempt. 10 reasons to wish you had gone to the Foodbuzz Food Blooger Festival! 9. Pats of Irish butter eaten off of toothpicks...that's right - eating straight, pure BUTTER. 8. A delicious, devilish delight in street food and tacos that are, in fact "tacolicious." 7. Knowing that the Prather ranch is actually interested in your opinion on their new jalapeño sausage. 6. Figuring out a way to make a week's worth of dinner out of gift bag goodies - How awesome were those panko breadcrumbs by the way?! 5. Conversing with the makers behind Thirsty Bear, 21st Amendment and Speakeasy Ale. 4. An Outstanding dinner in the [field] Greenleaf Produce Warehouse with nectar straight from the Bonny Doon's Dionysian gods. 2. The amazement that can only result from a deliciously and heartfelt carved roasted pork and pig skin sandwich (Porchetta) from Roli Roti. 1. And.... drum roll, please? Last weekend's Foodbuzz Blogger Festival here in San Francisco was an unprecedented opportunity to taste, sip and mingle. Plenty of things stood out from the weekend, including Roli Roti's mini-porchetta sandwich with crispy skin, a delightful merlot from Blackbird, and all the great friends we made, but the chance to meet "spreadsheet cowboy" Brian Kenny of Hearst Ranch in San Simeon and hear a little about raising cattle they were meant to be. 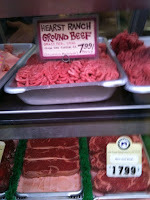 The session was advertised as a "farm to table" seminar between Kenny, the local rancher, and Paul Arenstam, head chef at Americano, which uses Hearst ranch ground beef in his restaurant's (reputedly excellent) burgers. 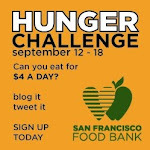 Now here in San Francisco we hear a lot about local food and the relationships between small farmers and restaurants. Frankly, it can get pretty tiresome - especially when the description of a hamburger can run to several lines in order to fit in the source of everything from the beef to the pickles. So we expected to hear the party line about food miles, the importance of small farms, and other reasons that we should feel warm and fuzzy for spending $3 per pound on zucchini. But Kenny was refreshing, showing up complete with cowboy hat, drawl, and a radically simple idea: "if it doesn't work for everyone, it isn't sustainable." We may not have a drive through (yet) but you can now get the same great Guerrilla Gourmet action, to-go! We've been resistant to jump on the Twitter bandwagon for awhile...but with Foodbuzz Food Blog Festival approaching, we just had to admit it's brilliance. And thus, we bring you - Guerrilla To-go. Follow us this weekend as we meet people from the food blogging community that has so warmly embraced us in this endeavor. Plus, you'll get to hear about all the crazy things we're eating and doing at the festival, in real time action! After the festival, we'll be posting up dinner menus, lunch haiku, great finds for food in the city and money saving tips we could all use more of these days. And, since we're so completely Twiter newbs, let us know if you have any tips for us or if we totally do something wrong! So as Mr.Roger's used to say, "Won't you be my [twitter] neighbor?"